SPIED: F54 MINI JCW Clubman LCI - new tail lights! Home » Cars » SPIED: F54 MINI JCW Clubman LCI – new tail lights! 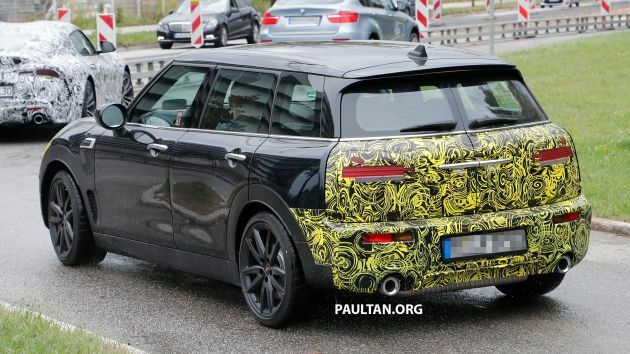 SPIED: F54 MINI JCW Clubman LCI – new tail lights! The F54 MINI Clubman will soon join the facelifted MINI range, it seems, as seen in this set of spy photographs. This particular model looks like a John Cooper Works Clubman prototype, albeit camouflaged on the front and back which mask the most obvious changes. One can expect updated LED headlights with the accompanying full-circle LED DRLs, although it’s unclear if the front apron will be changed at all. Going by the precedence set by the F56 Cooper Hatch facelift, perhaps the bumper won’t be reprofiled, but funky MINI Yours customisations such as the personalised plastic fender trim may be offered. At the back, the tail lights appear to feature horizontal LED bars as opposed to the outgoing circular graphics. Below that, it’s dressed with a minimalistic diffuser, complete with a set of dual exhaust exits. Of course, it will receive the new two-dimensional MINI logo as well. Performance-wise, expect the JCW Clubman facelift to feature the same 2.0 litre turbo four-cylinder engine from the current model. There, the engine produces 231 hp from 5,000 to 6,000 rpm and 350 Nm of torque between 1,450 to 4,500 rpm. It will likely not get the new rapid-shifting seven-speed DCT, instead settling for the carryover eight-speed sport automatic gearbox and an All4 all-wheel drive system. Key performance figures include a century sprint time of 6.3 seconds and a top speed of 238 km/h. Isn’t that the BMW….I mean Toyota Supra in front? Previous Post: Mazda Technology Briefing 2018 – rotary engine in EVs detailed; next-gen Mazda 3 to debut in November?